Our college dining hall at Furman, fondly referred to as the "DH," put out a few well-known specialties. Chicken Finger Tuesday, Quesadilla Thursday, and oh my gracious, those black bean cakes! 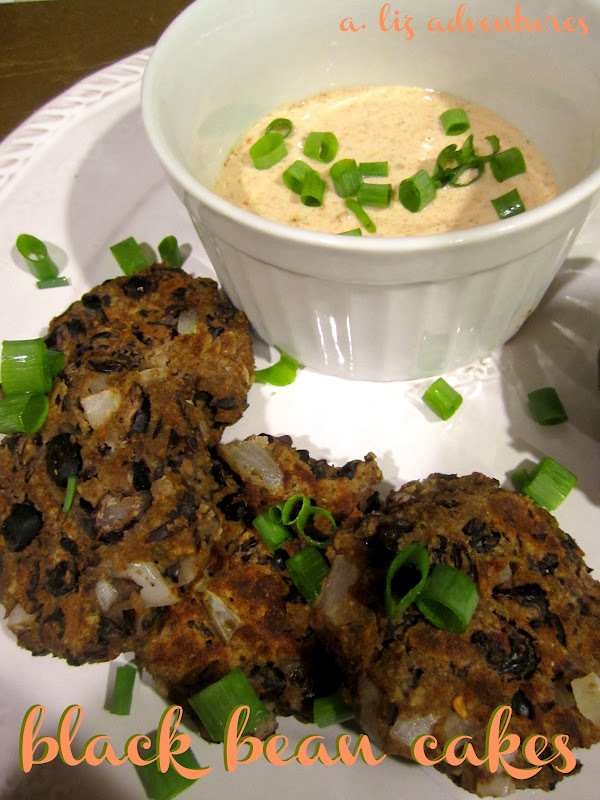 The black bean cakes had a cult following. And recently I asked my friends on Facebook how they might go about recreating the sauce that accompanied said black bean cakes. Thirty-two comments later from college girlfriends, I was just about ready to give it a try. Combined with a basic recipe outline from Natalie at Designer Bags and Dirty Diapers, here's what I came up with. Add all ingredients in a bowl, smashing black beans with a fork and mixing until combined. When mixed together completely, shape into balls and then flatten. Put on a plate, cover with plastic wrap, and refrigerate at least 20 minutes. Warm a grill pan on medium heat, and cook each side until it gets firm and warmed through. Make at least 20 minutes in advance to let flavors combine together. I thought that grilled avocados (which I just broiled this evening) would be the perfect accompaniment. I poked the avocado half with a fork, squeezed on lime juice, topped with a few shakes of Texas Pete, and then covered with Mexican cheese and a little Parmesan cheese too. It was a beautiful plate! All in all, my recreation of the DH's black bean cakes was a success! I love eating a vegetarian meal when I can, and this one definitely tasted like a treat. 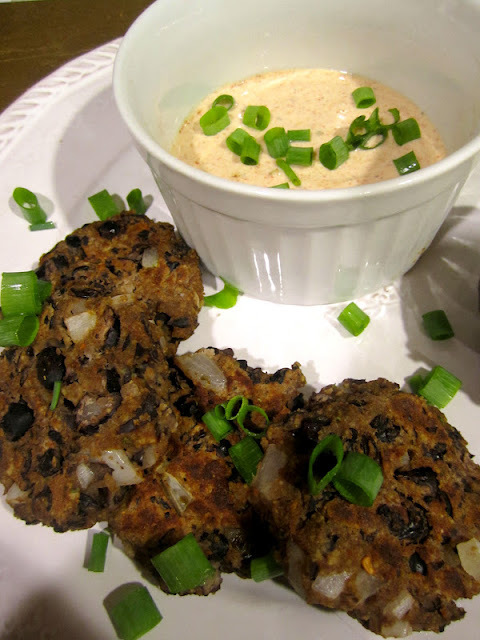 April- I love your blog and as a fellow Furman grad- of course I love black bean cakes! So glad you posted this recipe! Your fried fish tacos are on the menu for this week... I think these black bean cakes will be for next week! 1. I have to try these. 2. You went to Furman University in SC? My sister is applying there and its her top choice. I had never heard of it when I went to school but she is so in love! Wow...that looks amazing!! Can't wait to try everything.